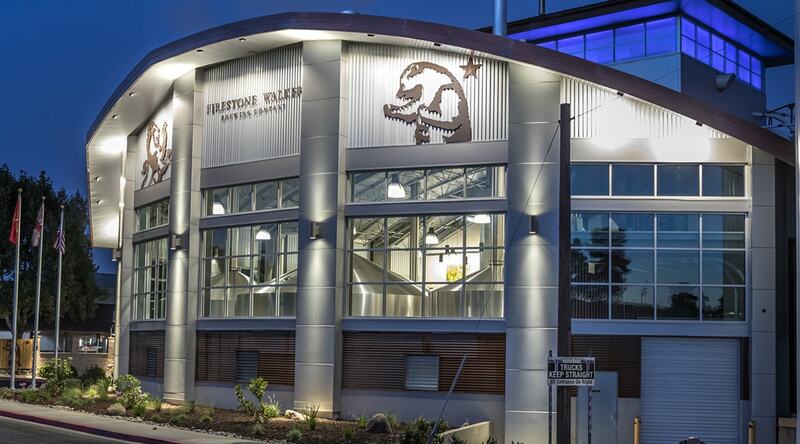 Firestone Walker Brewing Company is a craft brewery based in Paso Robles, California. The brewery has experienced significant success, gaining recognition with a number of international awards for its beers. And it now operates three facilities – the others located in Buellton and Venice. 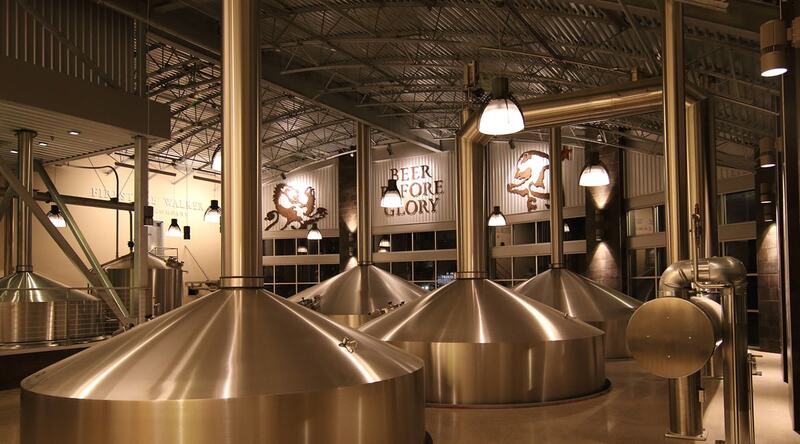 In fact the brewery’s growth has required the addition of a new 10,000 sq. ft. brew house at its Paso Robles headquarters in order to meet the steep increase in demand for its products. Harris Architecture was mandated to design the new space with the goal of increasing production capacity. 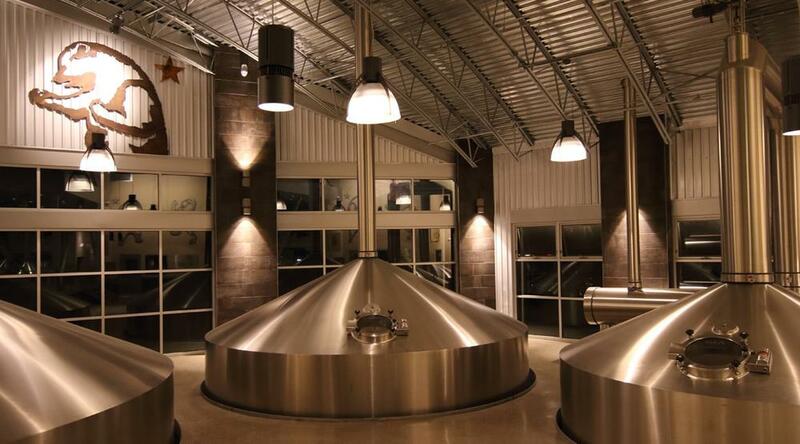 As well as being a fully functional brewery, the Paso Robles location also offers tours to visitors, and after an 8-month construction period, the new addition was opened to the public in May, 2017. The team from Harris worked closely with the Firestone Walker founders to ensure that every element of the new space was on point from a design and usability perspective. 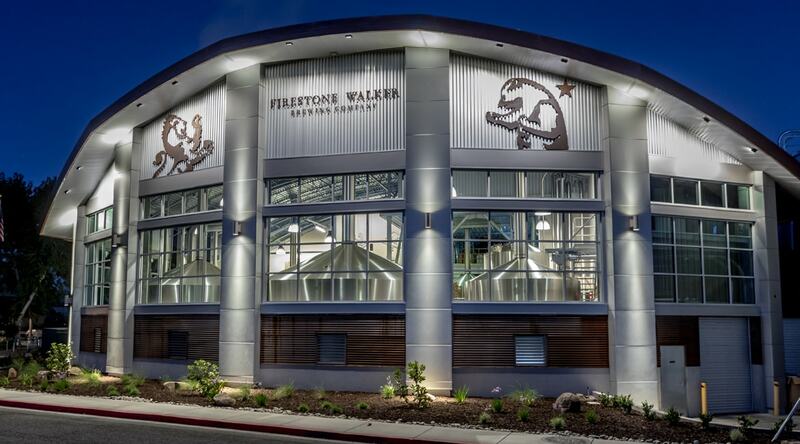 Everyone involved in the project was very conscious of choosing the right pieces to present the facility as the iconic, signature location in the Firestone Walker family of facilities. Lighting the space was an important piece of the design. The lighting had to be functional as well as fitting aesthetically with the design intent of the space. In collaboration with Prudential Lighting Products, the Harris team identified Luminis products as the perfect solution. Luminis’ Torx and Aramis products were chosen. 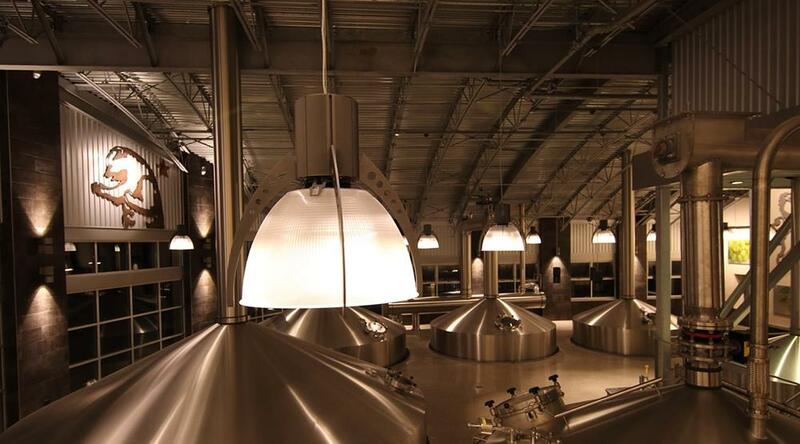 Twelve Torx TR2450 pendants were selected to illuminate the brew deck. The Torx TR2450 products are decorative and functional ceiling pendants with a frosted acrylic refractor and an LED light source. Delivering more than 12,000 lumens per product, the pendants are ideal for areas where efficiency, reliability and aesthetics are important. To carry the aesthetic throughout the facility, two more Torx TR2450 pendants have been included in the visitor center. Four Aramis AR148 pendants were used for additional illumination, while thirteen wall-mounted Aramis AR148 luminaires are positioned around the perimeter of the room. Most of the Aramis AR148 wall mounted sconces are in pairs – one as an uplight, and one as a downlight in each pair – providing a striking accent. The 6” cylindrical luminaires have an LED light source and deliver 2,050 lumens. Outside of the building, Harris chose Luminis’ Syrios SY602 products, complete with LED light source and unique integral tilting mechanism for precise directional aiming. Used primarily to illuminate the Firestone Walker signage and accent the curved roof, the products really catch the eye. Finally, Eclipse Mini EC612 products illuminate the exterior of the main entrance providing the complete lighting experience from outside to inside – a testament to the wide array of interior and exterior products offered by Luminis. The Eclipse Mini EC612 models, durable and designed to withstand extreme weather conditions, are mounted to the wall either side of the front door and on the columns supporting the covered entry. All of the interior lighting is on a dimming channel, enabling adjustment depending on the time of day. During the night, brew house lighting is turned up to deliver 100 foot candles of light at floor level to assist with nightly cleaning. In the daytime, the lighting is scaled back to deliver 45-55 foot candles at floor level for standard use. Artists and interior architects have long understood that colours can affect our feelings, emotions and mood. This is why the rooms in a hospital are often green – green calms and reduces stress. Other colours such as red, orange, yellow, blue, etc., have a different effect on the body. Chromotherapy, a.k.a. colour therapy studies these effects. Chromotherapy or colour therapy is based on the premise that colours and light can be used to correct physical ailments. Depending on the location and nature of the ailment a specific colour may ease it. One of the first scientists to consider the effect of colours was August Pleasonton. In 1876 he published ‘The Influence of the Blue Ray of Sunlight and of the Blue Color of the Sky’ in which he studied how blue can stimulate the growth of plants and cattle. He also mentioned that this colour can help make the human body better. This book introduced chromotherapy into modern medicine. Colour therapy should not be confused with light therapy. 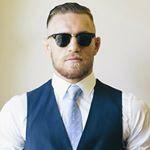 In light therapy a person is exposed to a bright white light over a certain time. Light therapy is often used to treat skin diseases (more specifically psoriasis), sleep disorders and certain psychic problems. Does your job demand a lot of creativity? Then orange can help. Orange stimulates the creative thought process and helps you come up with new ideas. This colour is linked to breathing. Breastfeeding women could benefit from orange light because it stimulates the production of breast milk. Coloured lighting cannot only create a certain atmosphere, it also affects our body. Correctional facilities place a high priority on safety, security, and operational efficiency. LED lighting systems, can help meet or exceed performance standards in all three of these areas. Due to the instant-on and dimming capabilities of LED systems, new control methods are now practical and promise to allow even greater performance. In Stockholm, AF Lighting has designed a media facade that reflects the weather, and helps build the brand of a major insurance company. The head office of Swedish insurance company If sits directly above a busy motorway just north of Stockholm. It has always been an imposing building – but rather an anonymous one, with an unlit facade. ÅF Lighting was asked to do something about that. The resulting solution is characterized by a soft, welcoming light, which matches the recently updated visual guidelines of the insurance company, and its concept of being “close to the people”. For many years, the one distinguishing feature of the building was an old digital clock sitting on top of it, which also displays outside temperature, as a service to passers-by. ÅF Lighting kept this in mind when creating the lighting concept, which involves LED strips being fitted to the entire facade, with a dynamic light flowing through them like changes in the weather. The lighting scheme also reflects actual local weather conditions, enabling the public to experience the façade lit according to natural conditions such as wind, snow, rain, sun and clouds as well as the seasonal changes. The work also included to update the old clock with a new design and new media logo. Apart from conveying a message about the weather, the lighting also gives the building a lighter, more dynamic feel, and provides an aesthetic experience for car-borne commuters on an otherwise eventless motorway. Installing the light rods proved to be the most challenging part of the project. As the façade faces a motorway, building cranes could not reach to all the necessary installation areas. Instead, climbers were hired to perform the work. ”It looked absolutely terrifying, but the results are extraordinary”, says an evidently pleased Francesco Guastella. Now commuters are met by a beautiful façade each day, reflecting the weather in that particular moment. In other words, the lighting helps communicate the If brand, and adds value to people in their everyday lives. The Base Building solution for 115 Batman Street was designed to meet with the Green Star requirements of the project. The overall building design utilizes an integrated design ideology, taking significant advantage of the available daylight via both the high and extensive glazing. Window screening is used to provide amelioration of direct sunlight where necessary and the lighting control system that manages the lighting throughout the tenancy is linked to photo electric cells to dim the luminaires in relation to the available daylight. Motion sensors are also provided throughout to manage the lighting after hours by activating the lighting in areas of movement. The fitout orientated spaces including the main reception, meeting rooms were designed with large luminous grids of pendants while the staff breakout space was designed to be deliberately different with custom pendants that feature panoramic photo montages of the Royal Botanical Gardens. Francesconi Architectural Light illumina Marina Landscape, le vie che accompagnano i visitatori al rinomato Nobu Restaurant, situato all’interno del lussuoso Four Seasons Hotel di Doha in Qatar: un capolavoro architettonico a tre livelli affacciato scenograficamente sul Golfo Persico raggiungibile da un’arteria di grande viabilità che necessitava di un’illuminazione sicura, performante e di qualità. Per il prestigioso progetto di illuminazione urbana sono stati scelti gli incassi a terra EGO e MAXIEGO, apparecchi illuminotecnici per esterni con grado di resistenza IP67 e agli urti IK10. Interamente realizzati con il migliore Acciaio Inox 316L, questi prodotti sono garanzia di ottime prestazioni in ambienti ad elevata umidità e salinità tipiche delle zone costiere del Golfo Persico. Diffusore in vetro temprato, viti di chiusura in acciaio inox A4, guarnizione in silicone e controcassa in policarbonato V1 (850°) completano il quadro di una gamma di incassi a sorgenti LED dalle altissime prestazioni. Francesconi Architectural Light, che ha sede a Roncadelle in provincia di Brescia, da oltre 60 anni opera nell’ambito dell’illuminotecnica: dalla produzione di apparecchi per esterni altamente performanti alla consulenza progettuale di elevata specializzazione, l’azienda sviluppa la propria attività su una superficie di 6500 mq, di cui 2500 mq coperti. Coniugando elevata resistenza e confort visivo, know-how tecnico e qualità formale e funzionale, il team Francesconi ha donato un effetto particolarmente scenografico alle strade di questa grande città dal forte carattere cosmopolita, segnando i percorsi, esaltando i dettagli e guidando gli ospiti verso il più grande e noto ristorante del Qatar. On October 13, 2016, Boston mayor, Martin J. Walsh unveiled the new LED-based architectural lighting of Boston City Hall. The lighting debut was during this year’s final Beer Garden on the Bricks event, themed “Light Bright Beer Garden.” The city intends the new LED lighting to highlight and enhance the building’s original design and increase public safety. The exterior lighting installation is one among several ongoing initiatives to highlight City Hall and City Hall Plaza and make them more inviting for residents. 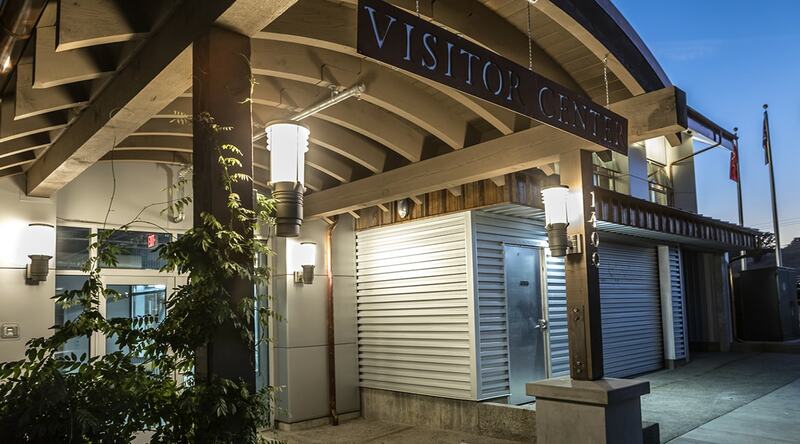 New LED fixtures replaced the original Metal Halide exterior recessed lighting and the existing floodlights that illuminate the building’s lower levels and accentuate the entrances. The new fixtures cover the building in a warm white light, and they can produce a broad range of colors. Such color options can allow the City to light the building to acknowledge a variety of celebratory and public events. The mayor lit the building blue to recognize the police officers injured in East Boston, and as a further demonstration of its light changing capability, the mayor changed the color to pink in honor of Breast Cancer Awareness Month. The pink lights at city hall added to pink lighting of numerous buildings and landmarks around the city. The lighting highlights the original three-part design of City Hall. The lower levels house the public spaces of the building. The symbolic spaces including the middle sections hold the offices of the Mayor and the City Council, and the administrative spaces crown the building and house the administrative functions of government. According to the city, the new exterior lighting improves security lighting. The city says that the system allows for the floodlights and associated conduit added to the building over the years to be entirely removed. The new fixtures are more energy efficient than the Metal Halide fixtures and the existing Flood Lights that they replace. The LED lighting is expected to save the city about 300,000 kWh of electricity annually compared to the replaced lights. The LED technology has a projected 20-year lifespan compared to the 4-year life of the metal halide lights that the LED system replaces. The City expects additional savings from the cost of maintenance and light replacement. Arcade lights have also been retrofitted with LED lighting to complement the new City Hall lighting. The same controller will be able to operate and coordinate both the arcade lights and the City Hall lights. “It is wonderful that the City is taking this opportunity to recreate its own home place – City Hall – as the keystone and central event in an ongoing pursuit of improved illumination for our city,” said Todd Lee, President of LIGHT Boston. An appreciative whoop went up from the crowd gathered Thursday night as the switch was flipped on the latest light installation by San Antonio artist Bill FitzGibbons. From a vantage point on the 21st floor of the Frost Bank Tower, members of the arts community and city officials watched as “Kinetic Skyline” illuminated the Bank of America Plaza with a display of blue and green light. “I’m really over the moon about this project because with this tremendous support from the owners of the building we were able to realize one of the largest light sculptures in the state of Texas,” FitzGibbons said. Located at 300 Convent Street near the Tobin Center for the Performing Arts, the 28-story Bank of America Plaza is one of the tallest buildings downtown. “It’s got all these stair step bays that go up along the side of the building, and so I thought that that would be really an interesting approach to go in there and emphasize those bays, which you visually can’t really see from a distance,” FitzGibbons said earlier. Created with computerized LED lights, the effect of the installation is of a series of eight columns climbing up facades on the north and south sides of the building. FitzGibbons also created programs for holiday displays. 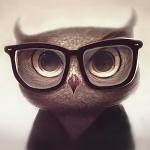 Thursday night, he demonstrated the schemes for the Fourth of July and Fiesta. The Bank of America Plaza is owned by Houston-based Griffin Partners and New York-based Clarion Partners. It is currently undergoing capital improvements. FitzGibbons has created several light-based public artworks around the country. In San Antonio, they include “Centro Chroma Tower” at VIA’s Centro Plaza; “San Antonio Colorline” at the University Health Center-Downtown Brady Green Clinic; “Light Channels,” beneath the underpasses at Commerce and Houston streets; and “Day Star Archway” at the San Antonio International Airport. He has received videos of bands performing and photos taken at the underpasses transformed by the installations.